Silk Bedding Direct is well known for providing the very best high end luxury mulberry silk-filled duvets, mattress pads and pillows. This is due to our use of only the very best materials, high production standards, and the little touches that distinguish us such as the precision hand finishing of every duvet we produce. Through this website you can buy silk duvets and find out about Silk Bedding Direct's high end luxury silk duvets. You may also buy silk-filled pillows and silk-filled mattress pads. And find out about these very special luxury silk-filled pillows and mattress pads. 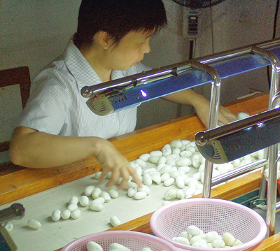 Below are various articles and resources related to silk, bedding or both, we hope you will find these of interest and check back from time to time for updates. Click below to find out about our luxury silk-filled pillows, duvets and mattress pads for the bed size of your choosing.